It is four weeks since the start of the notorious military offensive on Afrin by the second-biggest Nato force in the world, Turkey. The Turkish military apparatus designed their operation ‘Olive Branch’ to last for a few days, not a few weeks, to take control of Afrin but their progress has been greatly slowed by the fighters of the YPG and YPJ. The whole world is watching how the YPG fighters are defending their land and dignity against the barbaric forces of Erdogan which have low morale and are underpaid by their masters. Turkey, with its worst president since Kemal Ataturk, launched this attack on two pretexts: first to enhance Turkish national security and second to eliminate the hope of the Kurds in the north to have their own haven. However, by attacking Afrin, the Turkish military has hugely damaged their national security. They are getting back the bodies of their soldiers on a daily basis and, following an initial wave of pro-government chauvinism, this will generate more dissent within Turkey. Among the more liberal and democratic in Turkey there is a sense of inherited inferiority and many are fed up with the current situation which is dragging the economy downwards. Meanwhile the media in Europe and America are praising the fighters of the YPG backed by the PYD. Inspiringly, the people of Afrin didn’t surrender to the Turkish military which has deliberately targeted civilians but they have stayed in their city, contrary to what Turkey expected; they are adamant that Afrin will be a graveyard for Turkish forces and their proxies such as the Free Syrian Army and Daesh. Turkish military forces must wake up to the reality that they will not be able to keep their positions and continue these attacks on the people of Afrin. The military tactics adopted by the YPG fighters bear similarity to how the Vietnamese defeated American forces in a conflict resulting in the loss of 57,000 American soldiers along with four million Vietnamese. The Turkish army is weakened from the aftermath of the 2015 coup attempt, with around 15,000 generals and officers now held in Turkish jails. 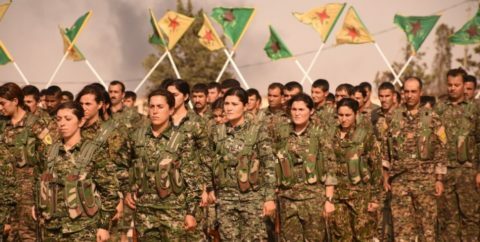 The YPJ and YPG fighters are digging in for a long war which is already working out in their favour for several reasons. First, Turkish public opinion is changing. Second, more fighters from all over the world are joining with the forces of the YPG. Third, the YPG and PYD have combined a strong belief in their cause with careful preparations and, for the last two years, they have extended the network of tunnels in Afrin so that, according to some observers, there are more of them than in the London Underground. Afrin’s dangerous situation has caused a political rupture between the USA and Turkey. But, despite recent rhetoric, there are signs the Turkish state wants to try to mend its relations with the US, with talks due to take place this week with the US Secretary of State. Turkey must accept now that it cannot win this war that it has started. The longer the so-called olive branch operation continues, the greater the number of Turkish casualties and the damage to the economy. Turkey should not be interfering in Syria’s internal affairs. The Kurds in the north of Syria do not pose a threat to Turkey. A continuation of this military action threatens to bring disaster to the whole of Turkey, whose international image has been grievously damaged by this aggression. Turkey must declare a ceasefire.